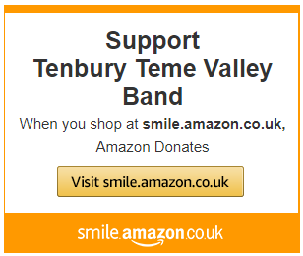 Tenbury Teme Valley Band had a hectic end of year in which it raised thousands of pounds for charity. The band had a very busy and successful 2018, including playing during the busy summer season in front of large appreciative audiences at three Worcestershire Parks- Abbey Park Evesham, Lido Park Droitwich and Gheluvelt Park Worcester. The band also enjoyed performing at several local fetes, theTenbury Applefest and at a Droitwich Waterways Pamela May Trust event. In support of this charity, the band played at an Open Gardens event. Proceeds were for the purchase of a specially adapted narrow boat for people with disabilities and nearly £5,000 was collected. The band also played on two consecutive Saturdays at Tesco in Tenbury to support the Royal British Legion Poppy Appeal. In the run up to Christmas the band were heard playing carols and Christmas music at Burford House Gardens on the first three Sundays of December and were raising money for the Green Fingers Charity which provides sensory gardens for children’s hospices. The ‘Christmas by Candlelight’ concert on Saturday 15th December at St Mary’s Church was a huge success and the band were delighted to be performing with the talented Tenbury Primary Academy Choir and KS3 choir once again. Both choirs are conducted by Kevin Bryant and the band would like to thank him for all his dedication and hard work throughout the year.